a little listening and dealing with politicians and the KTO union whose headquarters welcomes us. The Coalition comes, from its beginnings, preparing itself to carry out actions that have as a consequence the social change. Making the movement visible with its struggles is one of the tasks, perhaps the most important one, based on organizing actions, centralized like this one in Cyprus, or decentralized as the ones that each group does in their country. In both cases the Coalition echoes the demands of the inhabitants of each European region and publishes the contents created by each member as well as those created jointly (2 newsletters per year, book of evictions in Europe, the recent document Brochure , Et.). Work is important in all its forms. But the Action is what makes the most sense to the Coalition and so we feel it to those who integrate it. 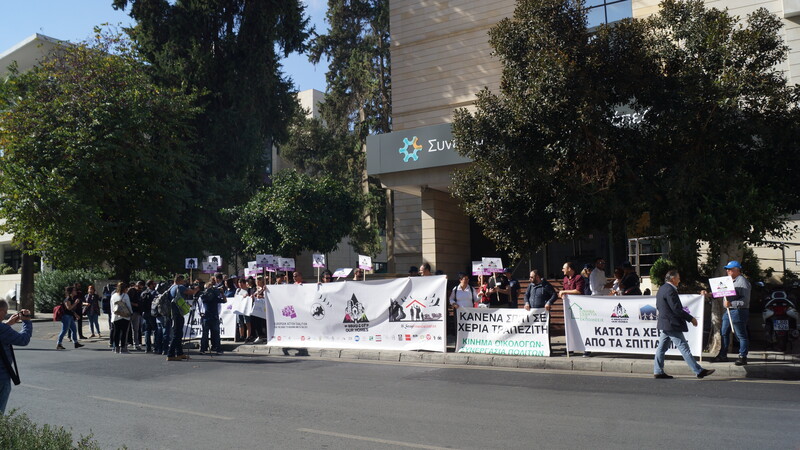 On this occasion, the Campaign against Financialization#HandsOffOurHomesstarts in Cyprus with a concentration in front of the Central Bank of Cyprus, at its headquarters in Nicosia, with a lot of attention from local media unaccustomed, perhaps, to international events of this type . And also in front of the seat of the Parliament of Cyprus delivering a document with our demands to its President. This Action is undoubtedly an important milestone for the European Coalition for the right to Housing and to the City as it means the launching of its first major campaign at European level. Campaign that is the result of a collective effort to analyze the different local situations, compare them and draw conclusions without surprises: Financing is a phenomenon that affects all of Europe. With differences according to the countries but with the common elements that allow us to join efforts to fight together for an inalienable right. The future of the Coalition, its strategic orientation and the upcoming meetings mark the final debate before we bid farewell to Cyprus. Thank you Cyprus compahs for such a good reception. un poco de escucha y trato con políticos y el sindicato KTO cuya sede nos acoge. La Coalición viene, desde sus inicios, preparándose para llevar a cabo acciones que tengan como consecuencia el cambio social. Visibilizar el movimiento con sus luchas es uno de los cometidos, tal vez el más importante, a base de organizar acciones, centralizadas como esta de Chipre, o descentralizadas como las que cada grupo hace en su país. En ambos casos la Coalición se hace eco de las demandas de los habitantes de cada región europea y publica los contenidos creados por cada miembro así como los creados de forma conjunta (2 boletines al año, libro de los desahucios en Europa, el reciente documento Brochure, Et.). El trabajo es importante en todas sus formas. Pero la Acción es lo que más sentido le da a la Coalición y así lo sentimos quienes la integramos. 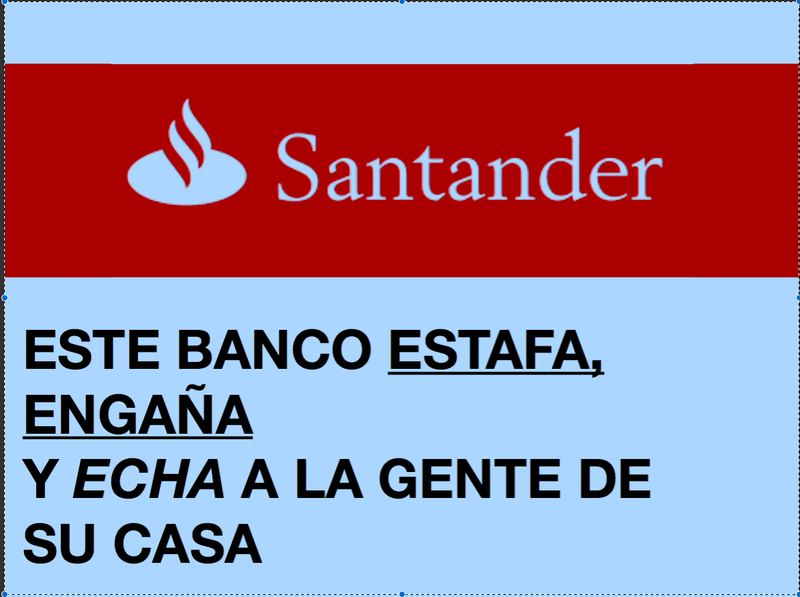 En esta ocasión se inicia en Chipre la Campaña contra la Financiarización #handsoffourhomescon una concentración ante el Banco Central de Chipre, en su sede en Nicosia, con bastante atención por parte de medios locales poco acostumbrados, tal vez, a eventos internacionales de este tipo. Y también ante la sede del Parlamento de Chipre entregando un documento con nuestras demandas a su Presidente. Es sin duda esta Acción un hito importante para la Coalición Europea por el derecho a la Vivienda y a la Ciudad por cuanto supone el lanzamiento de su primera gran campaña a nivel europeo. Campaña que viene a ser el resultado de un esfuerzo colectivo por analizar las diferentes situaciones locales, compararlas y extraer de ello conclusiones sin sorpresas: La Financiarización es un fenómeno que afecta a toda Europa. Con diferencias según los países pero con los elementos comunes que nos permiten unir esfuerzos para luchar juntas por un derecho inalienable. El futuro de la Coalición, su orientación estratégica y los próximos encuentros marcan el debate final antes de despedirnos de Chipre. Gracias compahs de Chipre por tan buena acogida. Hace unos días nos reunimos con Fátima Lorenzo directora ejecutiva de Ciudades Alternativas República Dominicana invitadas por las compañeras de Oxfam Intermon en la ciudad de Valencia. Estuvimos intercambiando experiencias en la lucha por la vivienda digna y nos contaron que Oxfam Intermón junto con colectivos y movimientos sociales de República Dominicana como CasaYa y Ciudades Alternativas han lanzado la campaña #CambiemoPrioridades que tiene como objetivo que el gobierno dominicano destine el 1% del PIB anual, que actualmente no gasta de forma eficiente ya que se destina a entidades duplicadas, gastos de representación, publicidad, etc., a reducir el problema de vivienda que sufre el 71% de la población. Exactamente 6.738.423 personas en República Dominicana carecen de vivienda digna, es decir, que no tienen vivienda o si la tienen no reúne las condiciones básicas de habitabilidad (suministros, sanitarios, etc.) y están construidas con materiales inadecuados, aun siendo un derecho constitucional igual que en España. A pesar de que República Dominicana ha sido la economía con mayor crecimiento en los últimos 30 años en América Latina, la inmensa mayoría de la población queda excluida de los frutos de ese desarrollo. El 45% de la población está en riesgo de exclusión social. República Dominicana es un país conocido como un lugar paradisíaco para ir de vacaciones, esconde una realidad de desigualdad extrema que impide que millones de personas en el país no vivan dignamente. Nosotras le contamos como poco a poco nuestra campaña Romper desde abajo, donde empezamos a intentar cambiar las políticas en materia de vivienda en Ayuntamientos con mociones, en Comunidades autónomas con las Leyes Autonómicas de Vivienda y que estábamos en el punto de llegar a instancias del Congreso y presentar nuestra #LeyViviendaPAH a nivel Estatal. Les hemos explicado las 5 demandas, el texto legal, y la campaña que llevábamos y hemos quedado en compartir todo este material para que puedan leerlas y tenerlas en cuenta. 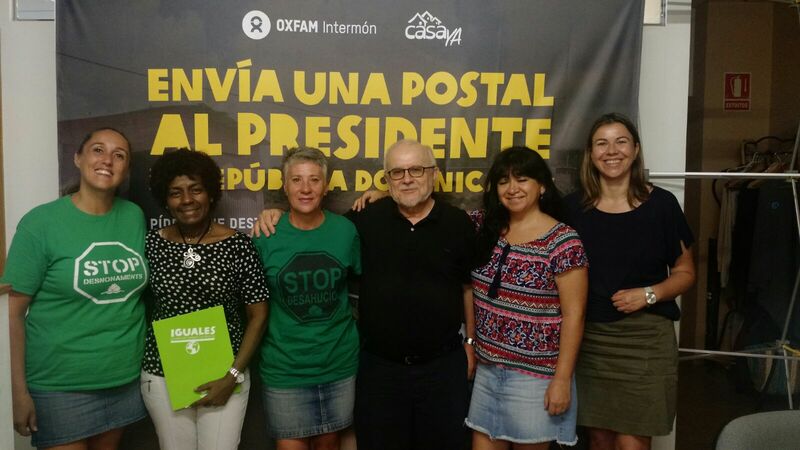 A few days ago we met with Fatima Lorenzo executive director of Alternative Cities Dominican Republic invited by the partners of Oxfam Intermon in the city of Valencia. We were exchanging experiences in the struggle for decent housing and told us that Oxfam Intermón together with groups and social movements of the Dominican Republic as CasaYa and Alternative Cities have launched the campaign #CambiemoPrioridades that aims to the Dominican government allocate 1% of GDP Annual, which does not currently spend efficiently since it is intended for duplicate entities, representation expenses, advertising, etc., to reduce the housing problem suffered by 71% of the population. Exactly 6,738,423 people in the Dominican Republic lack decent housing, that is, they do not have housing or if they do not have the basic conditions of habitability (supplies, sanitary, etc.) and are built with inadequate materials, even being a right Constitutional as in Spain. Although the Dominican Republic has been the fastest growing economy in the last 30 years in Latin America, the vast majority of the population is excluded from the fruits of that development. 45% of the population is at risk of social exclusion. Dominican Republic is a country known as a paradisiac place to go on vacation, hides a reality of extreme inequality that prevents millions of people in the country do not live worthily. 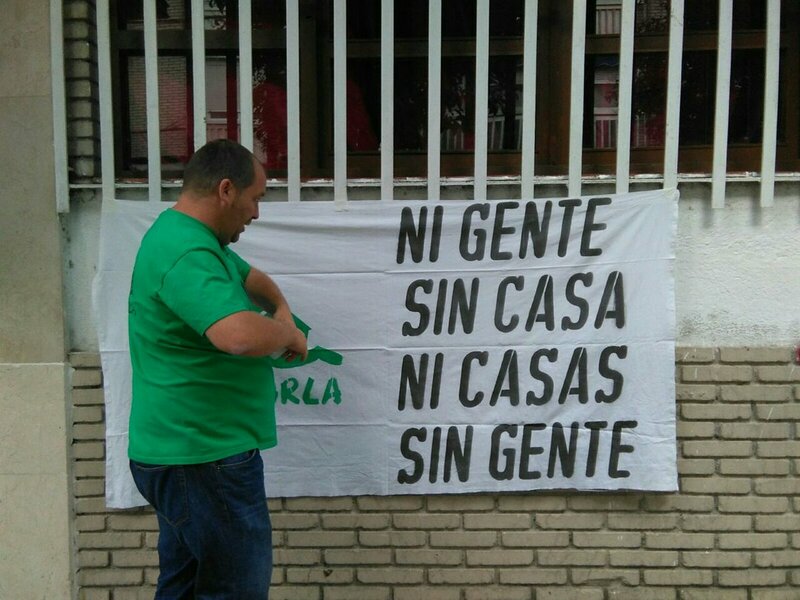 We tell you how slowly our campaign Break from below, where we began to try to change the policies on housing in municipalities with motions, in autonomous Communities with the Regional Laws of Housing and that we were on the point of arriving at the request of Congress And present our #LeyViviendaPAH at State level. We have explained the 5 demands, the legal text, and the campaign we had and we have been left to share all this material so that they can read them and take them into account. The World Social Forum aims to bring together tens of thousands of people from civil society groups, organizations and social movements who want to build a sustainable and inclusive world where each person and each people has their place and can make their voices heard. The WSF of 2016 was the first forum held in the Northern Hemisphere. The PAH participated in a roundtable discussion on urban housing, displacement and gentrification in the framework of the right to the city that took place on Friday, August 12 in a room with capacity for 200 people. The panel was named “The Fight for the Life of the Global City”. The panel lasted 2 hours and 30 minutes, where 60 minutes were spent for presentations, 20 minutes each presenter. After the presentation, there was a discussion of questions and answers. • How are you using the Right to the City Frames in your local work? • How does our work increase citizen participation? How does our work bridge the urban-rural divide? • What specific challenges to the Right to the City that we face in our local work? 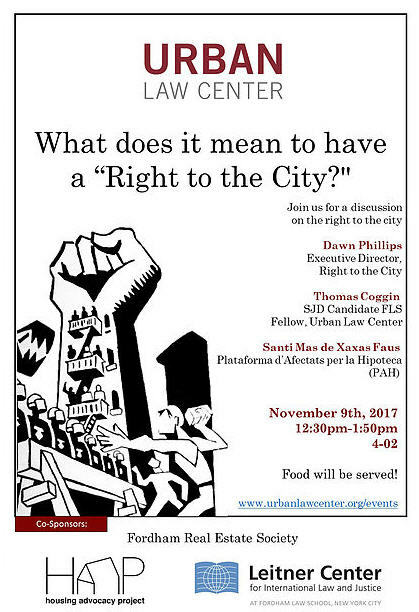 • How are we working or fighting against local and national institutions in advancing a Right to the City agenda? • How do we see international organizations and conferences as platforms to promote a Framework for the Right to the City? We also participated in the convergence assemblies for the right to housing, where housing groups from 5 continents attended, and which took place on Wednesday and Thursday from 4:00 p.m. to 6:00 p.m., thus learning from the problematic In terms of housing that other countries have and how they face it, exchanging experiences and international contacts. In addition we not only participated during the convergence assemblies but also in the meetings of organization of the same contributing ideas that would be debated during the said assemblies of. 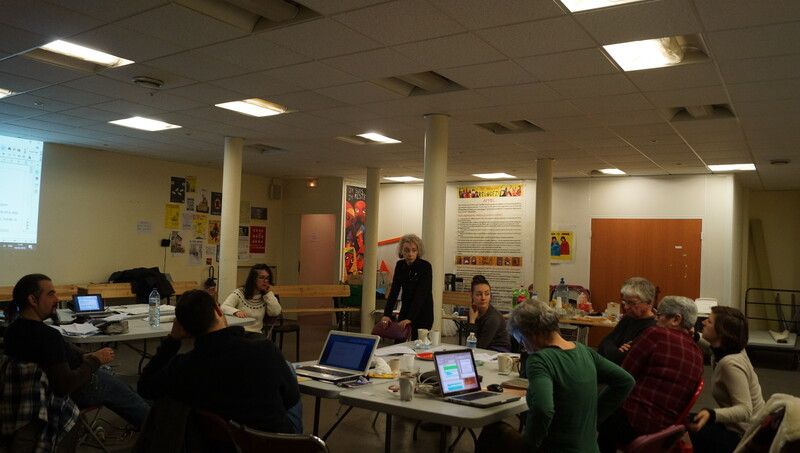 This invitation was extended to us as part of the European Coalition which was invited by Novox and Frapru, the local movements for the right to housing in Montreal, who were the driving force behind these assemblies. One of the proposals made by the PAH in these convergence assemblies was to build a network of social networks on Twitter and Facebook at the international level of the different movements in the fight for the right to housing to support campaigns that are carried out in different countries . This proposal is very well accepted.